Virgin Galactic's second SpaceShipTwo, the VSS Unity, takes its first flight with its carrier plane Eve as they soar over Mojave, California on Sept. 8, 2016. A Virgin Galactic SpaceShipTwo space plane took to the air under the wing of its massive mothership Thursday (Sept. 8), marking the first flight test for the private space travel company since a tragic accident in 2014. Virgin Galactic's second SpaceShipTwo spacecraft, the Virgin Spaceship Unity, soared over Mojave, California, in a captive carry test flight with its WhiteKnightTwo carrier aircraft, the Virgin Mother Ship Eve. Although the Unity spacecraft remained attached to its carrier plane for the entire flight, the test did mark Virgin Galactic's first return to airborne trials of SpaceShipTwo since the company's first spacecraft — the VSS Enterprise — broke apart during a rocket-powered test on Oct. 31, 2014. 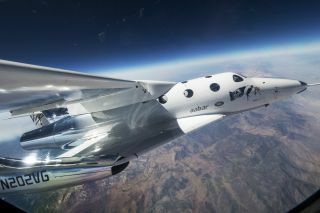 Virgin Galactic's SpaceShipTwo vehicles are designed to carry two pilots and six passengers on launches into suborbital space. The spacecraft cannot orbit the Earth, but it's expected to provide passengers several minutes of weightlessness and expansive views of the Earth from space before re-entering the atmosphere and gliding to a runway landing. Virgin Galactic is selling tickets for the experience at $250,000 per seat. Thursday's test flight took off from the Mojave Air and Space Port, with the VMS Eve carrying the VSS Unity to an altitude of about 50,000 feet (15,000 meters). That's the target altitude for the separation between a carrier plane and SpaceShipTwo during an actual launch. From takeoff to landing, the test flight lasted 3 hours and 43 minutes. "Today's flight test is going well," Virgin Galactic representatives wrote on Twitter during the flight. "It'll be longer than a typical mission, in part to test what happens when Unity gets very cold." The test flight also marked another milestone for Virgin Galactic, Branson added. "Any time a new vehicle is tested in the air is a big deal," Branson wrote. "The significance of yesterday's flight is that it is the first flight of a spaceship built entirely by The Spaceship Company and operated by Virgin Galactic." Virgin Galactic unveiled the VSS Unity spacecraft earlier this year, on Feb. 19. The spacecraft was already under construction by The Spaceship Company — a Mojave, California-based subsidiary of Virgin Galactic — at the time of the October 2014 accident. The Enterprise was in the midst of a rocket-powered test flight when it broke apart over the Mojave Desert, killing co-pilot Michael Alsbury and seriously injuring pilot Peter Siebold. An investigation into the crash by the U.S. National Transportation Safety Board found that Alsbury deployed the space plane's "feathering" re-entry system — twin tail booms designed to rotate upward during descent to increase drag and stability — too early. Virgin Galactic and The Spaceship Company subsequently built new safeguards into VSS Unity to prevent the type of accident that doomed Enterprise. Virgin Galactic's VSS Unity space plane and its carrier plane, the Virgin Mothership Eve, take off on their first captive carry flight from the Mojave Air and Space Port in California on Sept. 8, 2016. The memory of that 2014 accident seemed to be fresh on the collective mind of the Virgin Galactic team, based on the company's statements. "Today's an emotional day for us all. So grateful to our families, customers, & friends for sticking with us," Virgin Galactic representatives wrote on Twitter Thursday afternoon. "Couldn't open space without you." According to Virgin Galactic, Thursday's captive carry test flight is the first in a rigorous series of upcoming trials for VSS Unity. But the company stressed that it will only move forward after a thorough analysis of this week's test. "With this flight in the books, our team will now analyze a mountain of flight data, learning what worked well and what could be improved for our next flight test," Virgin Galactic representatives wrote. "Only when that analysis is done, along with detailed vehicle inspections, some already-planned work, and potentially more captive carry flights, will we be ready to move into the next phase of test flight."